There are different technologies available for measuring oxygen level in different environments such as Zirconia (ZrO2), electrochemical (also known as galvanic), paramagnetic, and optical methods. 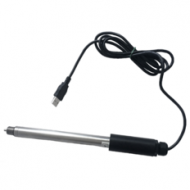 More recently, for biological and medical applications, optical oxygen sensors have become very important. Optical oxygen sensors are based on quenching of luminescence of dyes by oxygen. Typically, on the absorption of light at their absorption maxima, dye molecules exhibit long excited state lifetimes and emit radiation at longer wavelengths (fluorescence or phosphorescence). The excited state of the luminescent dye can be quenched by an energy transfer mechanism upon collision with oxygen molecules. As a result, the intensity of luminescence is reduced along with the lifetime and the degree of quenching is proportional to the oxygen concentration. 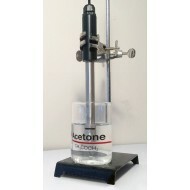 These sensors provide an alternative to the conventional electrodes due to their fast response and minimal reactivity with the analyte (no consumption of O2). 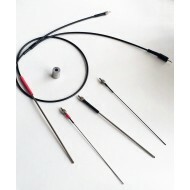 Our fiber optic oxygen sensors are used for the analysis of dissolved and gaseous oxygen pressure and the key to FMI highly stable oxygen sensors is that a proprietary nanoporous glass/ceramic thin film coating is used as a host matrix for sensing fluorophore element. FMI sensors are an excellent alternative to traditional electrodes and commercially available quenched luminescence-based optical sensors and they come in different forms, shapes, and sizes – depending on your application.